Kareo is a cloud-based platform that provides a comprehensive and integrated set of tools designed for medical administrators. With Kareo, users can manage a huge chunk of back-office tasks such as billing management, patient registration, health record management, medication management, and patient management. 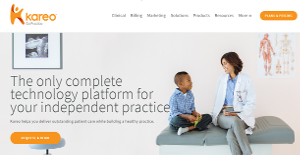 Kareo aims to facilitate the medical practitioners by making it easy for them to connect with their patients and also assisting them in managing the medical, financial and administrative data. More features of Kareo include scheduling and appointment management, administrative rule creation, productivity tracking, configurable dashboards, data tracking, information visualization, and progress reporting. The platform also helps medical professionals to quickly access insurance companies. Kareo’s Live Compliance program covers all areas required to becoming and remaining HIPAA compliant. Kareo has a fully customizable dashboard for the users, which they can use to display, track, and analyze the patient information. The software also provides the users with the features to create performance and productivity rules. Apart from tracking the patient data, Kareo has tools for analysis and reporting which the medical practitioners can leverage to generate different types of reports. Keeping the patient records through Kareo allows the medical professionals to track the health record of each patient, and manage their billing. Through proper tracking of patient’s payment records, the medical authorities can sort out the patients with outstanding dues. The ability of Kareo to connect with insurance companies in real time allows the medical professionals to quickly ascertain the eligibility of patients for insurance. The electronic prescription system in Kareo is yet another useful feature that saves a lot of time for medical practitioners that they otherwise invest in taking phone calls. When a patient wants a prescription for a common medical problem, he can get one from the phone through the automatic prescription system. Kareo comes with a built in messenger which the medical practitioners can use to communicate with each other quickly. The medical professionals can communicate with the patients too through this messenger. If you are considering Kareo it may also be beneficial to investigate other subcategories of Best EHR Software collected in our base of B2B software reviews. Since each company has unique business needs, it is sensible for them to desist from searching for a one-size-fits-all ideal software solution. Needless to say, it would be futile to try to find such an app even among popular software solutions. The smart thing to do would be to list the various important aspects that need consideration such as key features, finances, skill levels of employees, company size etc. Then, you should do your groundwork thoroughly. Read some Kareo reviews and investigate each of the other apps in your shortlist in detail. Such in-depth homework can make certain you discard ill-fitting applications and select the solution that provides all the elements you need for business success. How Much Does Kareo Cost? We realize that when you make a decision to buy EHR Software it’s important not only to see how experts evaluate it in their reviews, but also to find out if the real people and companies that buy it are actually satisfied with the product. That’s why we’ve created our behavior-based Customer Satisfaction Algorithm™ that gathers customer reviews, comments and Kareo reviews across a wide range of social media sites. The data is then presented in an easy to digest form showing how many people had positive and negative experience with Kareo. With that information at hand you should be equipped to make an informed buying decision that you won’t regret. What are Kareo pricing details? What integrations are available for Kareo? Cons: Customer service is absolutely atrocious. Horribly slow response times, failure to fix even then simplest problems, etc. Pros: The best aspect of the product was how quickly the services were implemented and available to my practice. Cons: I selected Kareo out of several electronic record companies. Initially when presented with the system- the customer service staff were extremely nice: offering to help, suggesting ways to may documenting easier, and offering extended services such as a billing solution. Well I was sold on the 'try free for 30 days'. I tried the software for a few days and realized I did not like the software. It was missing a few things that I needed for my practice. I called to speak to a 'coach' and was advised that my assigned representative was no longer available and that someone else would contact me. Well that never happened. Needless to say after about 10 days I no longer accessed Kareo software. I called customer service a few months later to inquire about billing and that is when I was met with rudeness. The staff spoke to maliciously, were extremely disrespectful, and argumentative. The worse was a lady by the name of Marlo V. I regret even signing up with this company. They lied to me and are money hungry. They are unsympathetic, do not listen to your concerns, and are only focused on how they can get your money for billing purposes each month. I do not recommend anyone utilize Kareo. Its not worth it to be scammed by the EHR/EMR company then be utterly spoken to without disregard and disrespected. The best aspect of the product was how quickly the services were implemented and available to my practice. If you need more information about Kareo or you simply have a question let us know what you need and we’ll forward your request directly to the vendor.